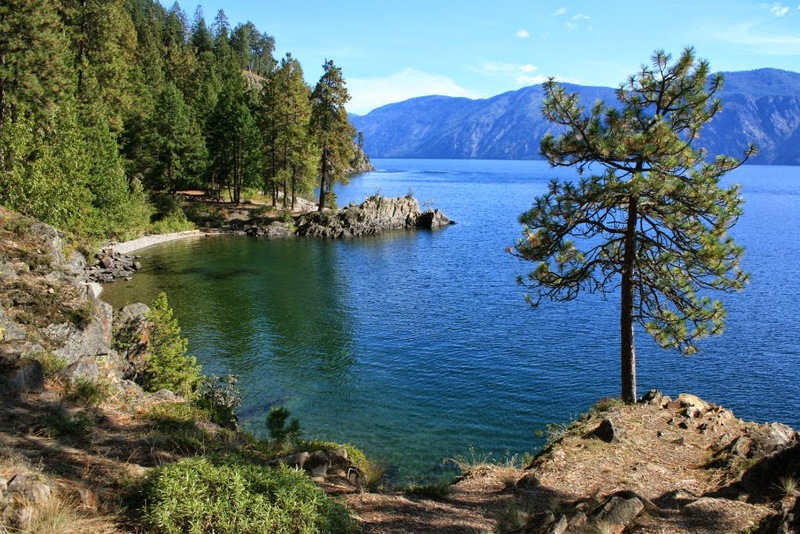 Want the feel of the Ocean on an Inland Lake then Lake Pend Oreille is your ticket. This lake is great for almost any size boat, but at times has ocean like swells and can possibly have very rough ocean like storm conditions (largest lake in Idaho). So keep your attention to the weather reports, particularly when on the east side of the lake where its challenging to hide from bad weather due to the lack of places to hid from bad weather. 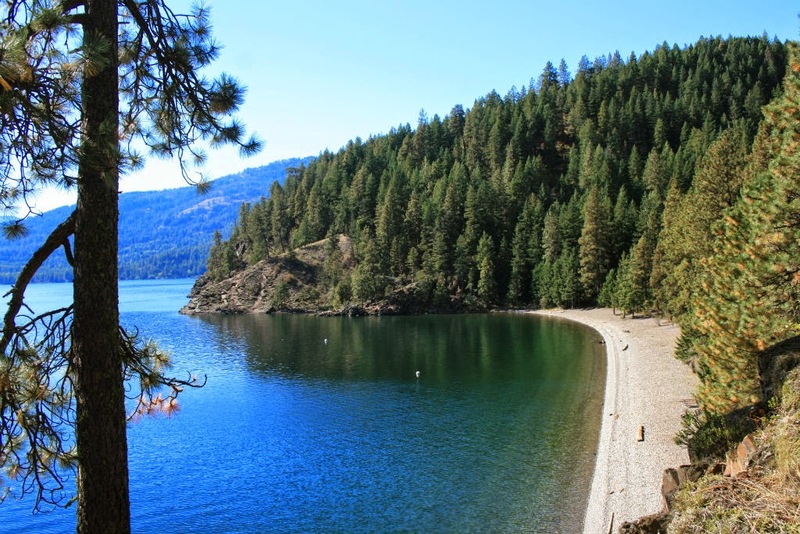 Lake Pend Oreille has 111 miles of shoreline, is 43 miles long, fed by the Clark Fork River and other smaller rivers and streams, and is at least 11,158 feet deep. If the US Navy gave out the official stats for the areas they utilize they would show that they deemed some areas of the lake classified and do not supply official depth readings. The lake is so deep the US Navy test submarines out of Bayview. The lake water exits via Pend Oreille River to the Columbia River. The scenery is spectacular with islands and mountains to the north and sheer cliffs to south (home to a mountain goat population). The city of Bayview known for its floating houses (north end of the lake) is by far the official sailboat town on this lake and has one congested public boat launch (watch for power lines when stepping your mast). Honestly its not a good location to launch from during the busy summer months due to the heavy boat traffic and lack of vehicle with trailer parking; and when leaving you have to travel out of a narrow channel that can also be congested. Next to Bayview Idaho is Farragut State Park the largest park in Idaho and neighbor to Bayview, (the official site of Inland WWII era training facility). Launching from Eagle Boat Launch is best as compared to launch from the Bayview launch, providing far more room for parking vehicles with boat trailers; though it can be at times congested in summer months. The best thing about this boat launch is that it is right on the open water with lots of dock space. For kayaks and dinghies there is a nice pebble beach to launch from and park at. There is a pump-out station and a reasonable fee to enter the park and use the boat launch ramp. During the summer there is also an evasive species wash station; do not expect to enter or leave this site without your boat and trailer being inspected. Beaver Bay rec. area at Farragut State Park (see picture below) has a swim area and is a nice place for kayakers to rest and use the restroom. Button Hook Bay at Farragut State Park (see picture below) has docks but no restrooms near by; you will have to hike about 1.5 miles to Beaver Bay to use a restroom. Button Hook Bay is a popular boating destination due to its beauty and a way to get out of the weather. 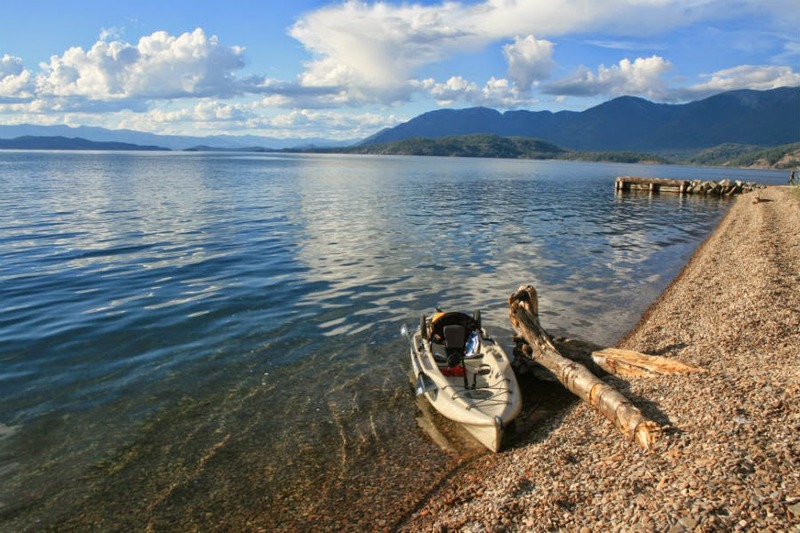 The city of Sandpoint is on the Northwest end of the lake and is a popular powerboat area with shallower and warmer waters. The city has two large launch areas, parks, and ample parking. The city also maintains a marina with some public space available for visitors. Fishing: Fish species info coming soon. See sign when fishing at this lake. For more fishing info call 208-769-1414. 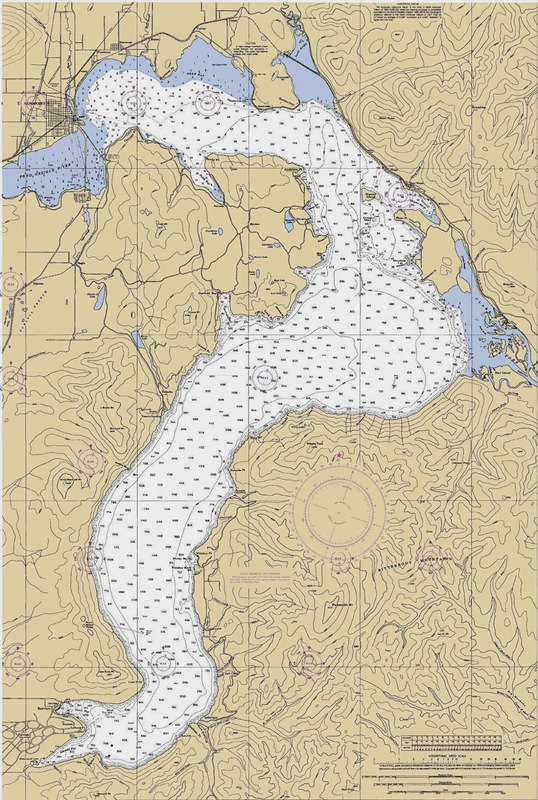 SAILING/WIND CONDITION INFO - Lake Pend Oreille has distinct wind patterns depending upon where you are that are useful for those sailing or water skiing/wakeboarding on the lake. On the South end of the lake (Bayview & Farragut State Park area) the prevailing winds come typically from the Southwest. Usually the prevailing winds during the summer months come from the east. 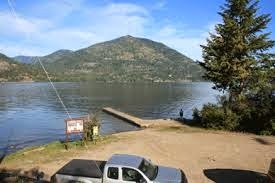 There are very high mountains around the south end of the lake that can at times can create thermal winds. With these high mountains it leaves very few spots to avoid the large waves that the wind and storms can create. On the North end of the lake by Sandpoint there are typically three different wind patterns: In the summer breezes come steady from an Eastern direction. But again when weather fronts come to this area they usually bring a Southwest wind. And sometimes during the night a wind will come from the north, from Canada, but usually die by noon. View pictures and info about boat launches, access points, etc. below! ACCESSIBILITY: PARKING... Paved parking lot; PATHS/TRAILS... Paved paths/trail to beach gravel area that then leads to the beach; RESTROOMS/FACILITIES/SHADE… Fully accessible restroom at the parking lot. Shade via trees; DOCKS/LAUNCHES/PLATFORMS… No docks/platforms. No developed launch. Launch from sandy beach; DIRECT WATER ACCESS… No developed access for wheeled mobility devices; TRANSFER SYSTEMS... None; SENSORY... No sensory tactile markers for those with visual and other impairments; CAMPING... No; O.T.H.E.R… Oddities/Barriers: Sand; Terrain: Mostly level and sandy; H2O/Water: Water normally clear. Water temperature in the summer can be around 60 to 70 degree. No drinking water available; Environmental Conditions: Varies; Resources: Food, drinks, and gas in town of Sandpoint, ID. ACCESSIBILITY: PARKING... Large paved parking lot; PATHS/TRAILS... Paved paths/trails throughout park, large paved area at launch area; RESTROOMS/FACILITIES/SHADE… Fully accessible restrooms. Shade via trees; DOCKS/LAUNCHES/PLATFORMS… Two accessible launch docks. One single lane and one double lane paved cement launches at about 5% grade; DIRECT WATER ACCESS… No developed access for wheeled mobility devices. There is a very long very sandy beach; TRANSFER SYSTEMS... None; SENSORY... No sensory tactile markers for those with visual and other impairments; CAMPING... No; O.T.H.E.R… Oddities/Barriers: Sand all along the shoreline; Terrain: Level to 5% grade at launches; H2O/Water: Water clear until mid to late summer. Water temperature in the summer can be around 60 to 70 degree. No drinking water available; Environmental Conditions: Varies; Resources: Food, drinks, and gas in town of Sandpoint, ID. ACCESSIBILITY: PARKING... Paved parking lot; PATHS/TRAILS... Paved accessible paths/trails along marina and to docks; RESTROOMS/FACILITIES/SHADE… Fully accessible restrooms with in park area. Shade via trees; DOCKS/LAUNCHES/PLATFORMS… Marina docks. Developed launch in park area; DIRECT WATER ACCESS… No developed access for wheeled mobility devices directly into the water; TRANSFER SYSTEMS... None; SENSORY... No sensory tactile markers for those with visual and other impairments; CAMPING... No; O.T.H.E.R… Oddities/Barriers: Nothing unusual; Terrain: Level to 7% grades on gangways; H2O/Water: Water normally clear. Water temperature in the summer can be around 60 to 70 degree. Drinking water available; Environmental Conditions: Varies; Resources: Food, drinks, and gas in town of Sandpoint, ID. ACCESSIBILITY: PARKING... Paved parking lot, limited parking; PATHS/TRAILS... Paved area up to the dock; RESTROOMS/FACILITIES/SHADE… None. No shade; DOCKS/LAUNCHES/PLATFORMS… One fully accessible dock with wide platform at end of dock. No developed launch. Launch from small sandy beach; DIRECT WATER ACCESS… No developed access for wheeled mobility devices; TRANSFER SYSTEMS... None; SENSORY... No sensory tactile markers for those with visual and other impairments; CAMPING... No; O.T.H.E.R… Oddities/Barriers: Sand; Terrain: level; H2O/Water: Water normally clear. Water temperature in the summer can be around 60 to 70 degree. No drinking water available; Environmental Conditions: Varies; Resources: Food, drinks, and gas in town of Sandpoint, ID. ACCESSIBILITY: PARKING... Large parking lot; PATHS/TRAILS... Paved paths/trail along short shoreline, and wide paved area to and at launch; RESTROOMS/FACILITIES/SHADE… Fully accessible restrooms. Shade via trees; DOCKS/LAUNCHES/PLATFORMS… Has docks and then sometimes the docks are not there, none of which is accessible to wheelchairs. Paved double lane cement launch at about 7% grade; DIRECT WATER ACCESS… No developed access for wheeled mobility devices. Absolutely no access to water other than via launch; TRANSFER SYSTEMS... None; SENSORY... No sensory tactile markers for those with visual and other impairments; CAMPING... No; O.T.H.E.R… Oddities/Barriers: Steep bank, no access other than at launch; Terrain: Level to 7% grade at launch. Steep banks to steep for access; H2O/Water: Water clear until late summer. Water temperature in the summer can be around 60 to 70 degree. Drinking water available; Environmental Conditions: Varies; Resources: Food, drinks, and gas in town of Sandpoint, ID. ACCESSIBILITY: PARKING... Gravel, dirt/mud parking lot; PATHS/TRAILS... No developed paths/trails. Primitive single track trail to beach area; RESTROOMS/FACILITIES/SHADE… None. Shade via trees; DOCKS/LAUNCHES/PLATFORMS… No docks/platforms. No developed launch. Launch from bank or shallow sand/dirt/mud beach; DIRECT WATER ACCESS… No developed access for wheeled mobility devices; TRANSFER SYSTEMS... None; SENSORY... No sensory tactile markers for those with visual and other impairments; CAMPING... Primitive camping along shoreline; O.T.H.E.R… Oddities/Barriers: Mud; Terrain: Mostly level; H2O/Water: Water normally clear. Water temperature in the summer can be around 60 to 70 degree. No drinking water available; Environmental Conditions: Varies; Resources: Food, drinks, and gas in town of Sandpoint, ID. ACCESSIBILITY: PARKING... Gravel, dirt/mud parking along road; PATHS/TRAILS... No developed paths/trails; RESTROOMS/FACILITIES/SHADE… None. Shade via trees; DOCKS/LAUNCHES/PLATFORMS… No docks/platforms. No developed launch. Launch from bank; DIRECT WATER ACCESS… No developed access for wheeled mobility devices; TRANSFER SYSTEMS... None; SENSORY... No sensory tactile markers for those with visual and other impairments; CAMPING... No; O.T.H.E.R… Oddities/Barriers: Mud/sand; Terrain: Level mostly; H2O/Water: Water normally clear. Water temperature in the summer can be around 60 to 70 degree. No drinking water available; Environmental Conditions: Extreme ocean like storms and large waves; Resources: Food, drinks, and gas in town of Sandpoint, ID. ACCESSIBILITY: No accessibility access features give access to this Island. ACCESSIBILITY: PARKING... Small gravel/dirt parking area; PATHS/TRAILS... No developed paths/trails; RESTROOMS/FACILITIES/SHADE… None. Shade via trees; DOCKS/LAUNCHES/PLATFORMS… No docks/platforms. Paved single lane cement launch at about 6% grade; DIRECT WATER ACCESS… No developed access for wheeled mobility devices. Absolutely no access to water other than via launch; TRANSFER SYSTEMS... None; SENSORY... No sensory tactile markers for those with visual and other impairments; CAMPING... No; O.T.H.E.R… Oddities/Barriers: Rocks shoreline; Terrain: Level to 6% grades; H2O/Water: Water clear until late summer. Water temperature in the summer can be around 60 to 70 degree. No drinking water available; Environmental Conditions: Extreme ocean like storms and large waves; Resources: Food, drinks, and gas in town of Sandpoint, ID. ACCESSIBILITY: PARKING... Gravel parking lot; PATHS/TRAILS... No developed paths/trails; RESTROOMS/FACILITIES/SHADE… None. Shade via trees; DOCKS/LAUNCHES/PLATFORMS… One dock that with effort one could get on with a wheelchair. Not designated wheelchair accessible. Paved single lane cement launch at about 5% grade; DIRECT WATER ACCESS… No developed access for wheeled mobility devices; TRANSFER SYSTEMS... None; SENSORY... No sensory tactile markers for those with visual and other impairments; CAMPING... No; O.T.H.E.R… Oddities/Barriers: Mud and rocks along shoreline; Terrain: Level to 5% grade; H2O/Water: Water clear until late summer. Water temperature in the summer can be around 60 to 70 degree. No drinking water available; Environmental Conditions: Extreme ocean like storms and large waves; Resources: Food, drinks, and gas in town of Sandpoint, ID. ACCESSIBILITY: PARKING... Gravel, dirt/mud parking along road; PATHS/TRAILS... No developed paths/trails. Steep incline into river that enters the Pack Delta bay to the lake; RESTROOMS/FACILITIES/SHADE… None. No shade; DOCKS/LAUNCHES/PLATFORMS… No docks/platforms. No developed launch. Launch from very steep bank; DIRECT WATER ACCESS… No developed access for wheeled mobility devices; TRANSFER SYSTEMS... None; SENSORY... No sensory tactile markers for those with visual and other impairments; CAMPING... No; O.T.H.E.R… Oddities/Barriers: Steep lose dirt, rocks bank, mud at shoreline; Terrain: Varies; H2O/Water: Water normally clear. Water temperature in the summer can be around 60 to 70 degree. No drinking water available; Environmental Conditions: Extreme ocean like storms and large waves; Resources: Food, drinks, and gas in town of Sandpoint, ID. ACCESSIBILITY: PARKING... Gravel, dirt parking area along road; PATHS/TRAILS... No developed paths/trails; RESTROOMS/FACILITIES/SHADE… None. Shade via trees; DOCKS/LAUNCHES/PLATFORMS… No dock/platform. Single lane broke pavement/gravel/dirt combo launch at about 7% grade; DIRECT WATER ACCESS… No developed access for wheeled mobility devices. Absolutely no access to water other than via launch; TRANSFER SYSTEMS... None; SENSORY... No sensory tactile markers for those with visual and other impairments; CAMPING... No; O.T.H.E.R… Oddities/Barriers: Marine vegetation along shoreline; Terrain: Level to 7% grades; H2O/Water: Water clear until late summer. Water temperature in the summer can be around 60 to 70 degree. No drinking water available; Environmental Conditions: Varies; Resources: Food, drinks, and gas in town of Hope, ID. ACCESSIBILITY: PARKING... Gravel parking lot; PATHS/TRAILS: No developed paths/trails; RESTROOMS/FACILITIES/SHADE… Fully accessible restrooms. Shade via trees; DOCKS/LAUNCHES/PLATFORMS… One accessible dock. Paved single lane cement launch at about 5% grade; DIRECT WATER ACCESS… No developed access for wheeled mobility devices; TRANSFER SYSTEMS... None; SENSORY... No sensory tactile markers for those with visual and other impairments; CAMPING... No; O.T.H.E.R… Oddities/Barriers: Sandy shoreline; Terrain: Level to 5% grades; H2O/Water: Water clear until late summer. Water temperature in the summer can be around 60 to 70 degree. No drinking water available; Environmental Conditions: Extreme ocean like storms and large waves; Resources: Food, drinks, and gas in town of Hope, ID. ACCESSIBILITY: PARKING... Large paved parking lot; PATHS/TRAILS... No developed paths/trails but wide paved area at launch and wide beach area; RESTROOMS/FACILITIES/SHADE… Fully accessible restrooms. Shade via trees; DOCKS/LAUNCHES/PLATFORMS… Two launch docks. Paved double lane cement launch at about 5% grade; DIRECT WATER ACCESS… No developed access for wheeled mobility devices. Wide paved area next to beach areas that gives really good access to the water, with assistance a persons using wheeled mobility devices could get into the water; TRANSFER SYSTEMS... None; SENSORY... No sensory tactile markers for those with visual and other impairments; CAMPING... No; O.T.H.E.R… Oddities/Barriers: Nothing unusual; Terrain: Level to 5% grades; H2O/Water: Water clear until late summer. Water temperature in the summer can be around 50 to 60 degree. No drinking water available; Environmental Conditions: Extreme ocean like storms and large waves; Resources: Food, drinks, and gas in town of Hope, ID. ACCESSIBILITY: PARKING... Gravel parking lot; PATHS/TRAILS... Short paved sidewalk along shoreline; RESTROOMS/FACILITIES/SHADE… Fully accessible restrooms. Shade via trees; DOCKS/LAUNCHES/PLATFORMS… One accessible dock. Paved single lane cement launch at about 5% grade; DIRECT WATER ACCESS… No developed access for wheeled mobility devices. Absolutely no access to water other than via launch; TRANSFER SYSTEMS... None; SENSORY... No sensory tactile markers for those with visual and other impairments; CAMPING... No; O.T.H.E.R… Oddities/Barriers: Sandy, rocky along shoreline; Terrain: Level to 5% grade at launch; H2O/Water: Water clear until late summer. Water temperature in the summer can be around 50 to 60 degree. No drinking water available; Environmental Conditions: Extreme ocean like storms and large waves; Resources: Food, drinks, and gas in town of Hope, ID. ACCESSIBILITY: PARKING... Paved parking lot; PATHS/TRAILS... No developed paths/trails. Paved area at dock/launch area; RESTROOMS/FACILITIES/SHADE… Fully accessible restrooms at resort. No shade; DOCKS/LAUNCHES/PLATFORMS… One dock at launch not wheelchair accessible and marina docks. Paved single lane cement launch at about 6% grade; DIRECT WATER ACCESS… No developed access for wheeled mobility devices. Absolutely no access to water other than via launch; TRANSFER SYSTEMS... None; SENSORY... No sensory tactile markers for those with visual and other impairments; CAMPING... No; O.T.H.E.R… Oddities/Barriers: No access to water other than via launch and dock; Terrain: Level to 6% grades; H2O/Water: Water clear until late summer. Water temperature in the summer can be around 50 to 60 degree. No drinking water available; Environmental Conditions: Extreme ocean like storms and large waves; Resources: Food, drinks, and gas in town of Hope, ID. ACCESSIBILITY: PARKING... Paved parking lot; PATHS/TRAILS... No developed paths/trails; RESTROOMS/FACILITIES/SHADE… Restrooms not fully accessible at resort. Shade via trees; DOCKS/LAUNCHES/PLATFORMS… One dock at launch not wheelchair accessible. Marina docks. Paved single lane cement launch at about 6% grade; DIRECT WATER ACCESS… No developed access for wheeled mobility devices. Absolutely no access to water other than via launch; TRANSFER SYSTEMS... None; SENSORY... No sensory tactile markers for those with visual and other impairments; CAMPING... No; O.T.H.E.R… Oddities/Barriers: Mud and rocks along shoreline; Terrain: Level to 6% grades; H2O/Water: Water clear until late summer. Water temperature in the summer can be around 50 to 60 degree. Drinking water available; Environmental Conditions: Extreme ocean like storms and large waves; Resources: Food, drinks, and gas in town of Hope, ID. ACCESSIBILITY: PARKING... Large paved parking lot; PATHS/TRAILS... No developed paths/trails; RESTROOMS/FACILITIES/SHADE… Fully accessible restrooms in store. Shade inside store; DOCKS/LAUNCHES/PLATFORMS… One dock next to launch, not accessible to wheelchairs. Paved single lane cement launch at about 6% grade; DIRECT WATER ACCESS… No developed access for wheeled mobility devices. Absolutely no access to water other than via launch; TRANSFER SYSTEMS... None; SENSORY... No sensory tactile markers for those with visual and other impairments; CAMPING... No; O.T.H.E.R… Oddities/Barriers: Mud and rocks along shoreline; Terrain: Level to 6% grade at launch; H2O/Water: Water clear until late summer. Water temperature in the summer can be around 50 to 60 degree. Drinking water available; Environmental Conditions: Varies; Resources: Food, drinks, and gas in town of Hope, ID. ACCESSIBILITY: PARKING... Large paved parking lot; PATHS/TRAILS... No developed paths/trails but several paved park roads works well for wheeled mobility devices; RESTROOMS/FACILITIES/SHADE… Fully accessible restrooms. Shade via trees; DOCKS/LAUNCHES/PLATFORMS… No docks/platforms. Paved single lane cement launch at about 5% grade; DIRECT WATER ACCESS… No developed access for wheeled mobility devices. Beautiful sandy beaches; TRANSFER SYSTEMS... None; SENSORY... No sensory tactile markers for those with visual and other impairments; CAMPING... Accessible tent and RV campsites; O.T.H.E.R… Oddities/Barriers: Sandy shoreline; Terrain: Level to 5% grades; H2O/Water: Water clear until late summer. Water temperature in the summer can be around 50 to 60 degree. No drinking water available; Environmental Conditions: Extreme ocean like storms and large waves; Resources: Food, drinks, and gas in town of Hope, ID. ACCESSIBILITY: PARKING... Small dirt/gravel parking area at launch; PATHS/TRAILS... No developed paths/trails; RESTROOMS/FACILITIES/SHADE… Non accessible restroom. Shade via trees; DOCKS/LAUNCHES/PLATFORMS… Two small short docks not wheelchair accessible. Single lane dirt/gravel launch at about 4% grade; DIRECT WATER ACCESS… No developed access for wheeled mobility devices; TRANSFER SYSTEMS... None; SENSORY... No sensory tactile markers for those with visual and other impairments; CAMPING... RV campsites with hookups; O.T.H.E.R… Oddities/Barriers: Rocky shoreline; Terrain: Level to 4% grade at launch; H2O/Water: Water clear until late summer. Water temperature in the summer can be around 50 to 60 degree. Drinking water available; Environmental Conditions: Extreme ocean like storms and large waves; Resources: Food, drinks, and gas in town of Hope, ID. ACCESSIBILITY: PARKING... Gravel, dirt/mud parking along shoreline; PATHS/TRAILS... No developed paths/trails; RESTROOMS/FACILITIES/SHADE… None. Shade via trees; DOCKS/LAUNCHES/PLATFORMS… No docks/platforms. No developed launch. Launch from low bank; DIRECT WATER ACCESS… No developed access for wheeled mobility devices; TRANSFER SYSTEMS... None; SENSORY... No sensory tactile markers for those with visual and other impairments; CAMPING... No; O.T.H.E.R… Oddities/Barriers: Mud; Terrain: Level; H2O/Water: Water normally clear. Water temperature in the summer can be around 50 to 60 degree. No drinking water available; Environmental Conditions: Varies; Resources: Food, drinks, and gas in town of Hope, ID. ACCESSIBILITY: PARKING... Gravel parking lot; PATHS/TRAILS... Paved path from restroom to launch dock; RESTROOMS/FACILITIES/SHADE… Fully accessible restrooms. No shade; DOCKS/LAUNCHES/PLATFORMS… One launch dock. Paved single lane cement launch at about 5% grade; DIRECT WATER ACCESS… No access for wheeled mobility devices. Absolutely no access to water other than via launch; TRANSFER SYSTEMS... None; SENSORY... No sensory tactile markers for those with visual and other impairments; CAMPING... No; O.T.H.E.R… Oddities/Barriers: Mud and marine vegetation along shoreline; Terrain: Level to 5% grade at launch; H2O/Water: Water clear until lake summer. Water temperature in the summer can be around 50 to 60 degree. No drinking water available; Environmental Conditions: Varies; Resources: Food, drinks, and gas in town of Clark Fork, ID. ACCESSIBILITY: PARKING... Gravel parking lot; PATHS/TRAILS... Some wide gravel paths/open areas to the river banks. Paved path from launch to restroom; RESTROOMS/FACILITIES/SHADE… Fully accessible restrooms. Shade via trees; DOCKS/LAUNCHES/PLATFORMS… One launch dock between cement double lane launch at about 6% grade; DIRECT WATER ACCESS… No access for wheeled mobility devices. Absolutely no access to water other than via launch or dirt/gravel/muddy area next to launch but again is not improved for wheelchair access; TRANSFER SYSTEMS... None; SENSORY... No sensory tactile markers for those with visual and other impairments; CAMPING... Primitive camping around launch area; O.T.H.E.R… Oddities/Barriers: Mud, dirty all along shoreline; Terrain: Level to 6% grade at launch; H2O/Water: Water clear until late summer. Water temperature in the summer can be around 50 to 60 degree. No drinking water available; Environmental Conditions: Varies; Resources: Food, drinks, and gas in town of Clark Fork, ID. ACCESSIBILITY: This site includes a mooring buoy; PARKING... See number 11 for parking info; PATHS/TRAILS... Sand, pebble path from dock to beach camping area, not wheelchair accessible; RESTROOMS/FACILITIES/SHADE… Fully accessible restroom. Shade via trees; DOCKS/LAUNCHES/PLATFORMS… One long landing dock. Not a floating dock so if the water level is low its a bit of a climb to get onto the dock; DIRECT WATER ACCESS… No access for wheeled mobility devices; TRANSFER SYSTEMS... None; SENSORY... No sensory tactile markers for those with visual and other impairments; CAMPING... Primitive camping at this site along beach opposite dock; O.T.H.E.R… Oddities/Barriers: Lots of sand and pebbles; Terrain: Sand and pebbles; H2O/Water: Water normally clear. Water temperature in the summer can be around 50 to 60 degree. No drinking water available; Environmental Conditions: Extreme ocean like storms and large waves; Resources: Food, drinks, and gas in town of Clark Fork, ID. Maps: See interactive google map above or visit google.com/maps type in Clark Fork River, Bonner County, ID. or GPS coordinates 48.144016, -116.262744 of mooring buoy. ACCESSIBILITY: Site includes a mooring buoy; PARKING... See number 11 for parking/launch info; PATHS/TRAILS... Sand, pebble beach camping area, not wheelchair accessible; RESTROOMS/FACILITIES/SHADE… One fully accessible restroom. Shade via trees; DOCKS/LAUNCHES/PLATFORMS… No docks/platforms; DIRECT WATER ACCESS… No access for wheeled mobility devices; TRANSFER SYSTEMS... None; SENSORY... No sensory tactile markers for those with visual and other impairments; CAMPING... Primitive camping along beach; O.T.H.E.R… Oddities/Barriers: Lots of sand and pebbles; Terrain: Level at shoreline to progressively more includes as one progresses up the mount; H2O/Water: Water normally clear. Water temperature in the summer can be around 50 to 60 degree. No drinking water available; Environmental Conditions: Extreme ocean like storms and large waves; Resources: Food, drinks, and gas in town of Clark Fork, ID. A. This mooring/campsite is closes to Lee's Landing near Johnson Creek Boat Launch. It has a nice beach for camping with no restroom. Not a site to hike the mountain from but has a nice rocky area to jump into the water and swim from. Directions: To access this site the closest launch is Johnson Creek #23 in the Clark Fork delta; Maps: See interactive google map above or visit google.com/maps type in Clark Fork River, Bonner County, ID. or GPS coordinates 48.130832, -116.284826 of mooring buoy. ACCESSIBILITY: Site includes a mooring buoy; PARKING... See number 11 for parking/launch info; PATHS/TRAILS... Sand, pebble beach camping area, not wheelchair accessible; RESTROOMS/FACILITIES/SHADE… None. Shade via trees; DOCKS/LAUNCHES/PLATFORMS… No docks/platforms; DIRECT WATER ACCESS… No access for wheeled mobility devices; TRANSFER SYSTEMS... None; SENSORY... No sensory tactile markers for those with visual and other impairments; CAMPING... Primitive camping along beach; O.T.H.E.R… Oddities/Barriers: Lots of sand and pebbles; Terrain: Level at shoreline to progressively more includes as one progresses up the mount; H2O/Water: Water normally clear. Water temperature in the summer can be around 50 to 60 degree. No drinking water available; Environmental Conditions: Extreme ocean like storms and large waves; Resources: Food, drinks, and gas in town of Clark Fork, ID. ACCESSIBILITY: Site includes mooring buoy; PARKING... See number 11 for parking/launch info; PATHS/TRAILS... Sand, pebble beach camping area, not wheelchair accessible; RESTROOMS/FACILITIES/SHADE… None. Shade via trees; DOCKS/LAUNCHES/PLATFORMS… No docks/platforms; DIRECT WATER ACCESS… No access for wheeled mobility devices; TRANSFER SYSTEMS... None; SENSORY... No sensory tactile markers for those with visual and other impairments; CAMPING... Primitive camping along beach; O.T.H.E.R… Oddities/Barriers: Lots of sand and pebbles; Terrain: Level at shoreline to progressively more includes as one progresses up the mount; H2O/Water: Water normally clear. Water temperature in the summer can be around 50 to 60 degree. No drinking water available; Environmental Conditions: Extreme ocean like storms and large waves; Resources: Food, drinks, and gas in town of Clark Fork, ID. ACCESSIBILITY: PARKING... Gravel/dirt parking area; PATHS/TRAILS... No developed paths/trails. Primitive trail along shoreline to the dock; RESTROOMS/FACILITIES/SHADE… None. Shade via trees; DOCKS/LAUNCHES/PLATFORMS… One non floating dock. Launch from bank; DIRECT WATER ACCESS… No developed access for wheeled mobility devices; TRANSFER SYSTEMS... None; SENSORY... No sensory tactile markers for those with visual and other impairments; CAMPING... No; O.T.H.E.R… Oddities/Barriers: Rocks and marine vegetation along shoreline; Terrain: Level to 5% grades; H2O/Water: Water clear until late summer. Water temperature in the summer can be around 60 to 70 degree. No drinking water available; Environmental Conditions: Extreme ocean like storms and large waves; Resources: Food, drinks, and gas nothing nearby. ACCESSIBILITY: PARKING... Gravel/dirt parking area; PATHS/TRAILS... No developed paths/trails. Primitive trail along shoreline. Paved road through camp area; RESTROOMS/FACILITIES/SHADE… One accessible restroom in camp area. Another restroom facility at bay area but not accessible to wheelchairs. Shade via trees; DOCKS/LAUNCHES/PLATFORMS… One long dock next to campground, not next to launch. Single primitive dirt/gravel/sand launch at about 6% grade; DIRECT WATER ACCESS… No developed access for wheeled mobility devices; TRANSFER SYSTEMS... None; SENSORY... No sensory tactile markers for those with visual and other impairments; CAMPING... Beautiful forested campground with primitive campsites, not designated for wheelchairs but but several campsites that are accessible wheelchairs; O.T.H.E.R… Oddities/Barriers: Mud, rocks, marine vegetation along shoreline; Terrain: Level to 6% grades; H2O/Water: Water clear until late summer. Water temperature in the summer can be around 60 to 70 degree in bay. No drinking water available; Environmental Conditions: Extreme ocean like storms and large waves; Resources: Food, drinks, and gas nothing nearby. ACCESSIBILITY: PARKING... Small gravel, dirt/mud parking area; PATHS/TRAILS... No developed paths/trails; RESTROOMS/FACILITIES/SHADE… None. Shade via trees; DOCKS/LAUNCHES/PLATFORMS… One non floating dock. No developed launch. Launch from bank or dock; DIRECT WATER ACCESS… No developed access for wheeled mobility devices due to trail from parking area is rough and rocky; TRANSFER SYSTEMS... None; SENSORY... No sensory tactile markers for those with visual and other impairments; CAMPING... No; O.T.H.E.R… Oddities/Barriers: Rocky shoreline; Terrain: level mostly, very rocky; H2O/Water: Water normally clear. Water temperature in the summer can be around 50 to 60 degree. No drinking water available; Environmental Conditions: Extreme ocean like storms and large waves; Resources: Food, drinks, and gas nothing nearby. ACCESSIBILITY: PARKING... Small gravel/dirt parking area; PATHS/TRAILS... No developed paths/trails; RESTROOMS/FACILITIES/SHADE… One old restroom that is not wheelchair accessible. No shade; DOCKS/LAUNCHES/PLATFORMS… One long non floating dock wheelchair accessible dock, protected with breakwater. Single lane gravel/sand launch at about 4% grade; DIRECT WATER ACCESS… No developed access for wheeled mobility devices. Absolutely no access to water other than via launch; TRANSFER SYSTEMS... None; SENSORY... No sensory tactile markers for those with visual and other impairments; CAMPING... No; O.T.H.E.R… Oddities/Barriers: sand; Terrain: Level to 4% grade at launch; H2O/Water: Water clear. Water temperature in the summer can be around 50 to 60 degree. No drinking water available; Environmental Conditions: Extreme ocean like storms and large waves; Resources: Food, drinks, and gas nothing nearby. Services across the lake at Bayview Idaho. ACCESSIBILITY: PARKING... Gravel, dirt/mud parking within park; PATHS/TRAILS... No developed accessible paths/trails, however there is a wide dirt trail to this site. Can be accessed with a wheelchair when not wet; RESTROOMS/FACILITIES/SHADE… Fully accessible restrooms within the park. Shade via trees; DOCKS/LAUNCHES/PLATFORMS… One large/long dock with three long fingers. No developed launch. Launch lightweight watercraft from bank/dock; DIRECT WATER ACCESS… No developed access for wheeled mobility devices; TRANSFER SYSTEMS... None; SENSORY... No sensory tactile markers for those with visual and other impairments; CAMPING... Fully accessible tent and RV campsites with hookups; O.T.H.E.R… Oddities/Barriers: Mud; Terrain: mostly dirt and some gravel, and paved areas in parking area of level to 7% grades; H2O/Water: Water normally clear. Water temperature in the summer can be around 50 to 60 degree. Drinking water available; Environmental Conditions: Extreme ocean like storms and large waves; Resources: Food, drinks, and gas in town of Bayview, ID. ACCESSIBILITY: PARKING... Paved parking lot above bay next to restrooms; PATHS/TRAILS... No developed accessible paths/trails, however there is a steep dirt trail to this bay below at about 8%; RESTROOMS/FACILITIES/SHADE… Fully accessible restrooms. Shade via trees; DOCKS/LAUNCHES/PLATFORMS… No docks/platforms. No developed launch. Launch lightweight watercraft from beach in bay; DIRECT WATER ACCESS… No developed access for wheeled mobility devices; TRANSFER SYSTEMS... None; SENSORY... No sensory tactile markers for those with visual and other impairments; CAMPING... Fully accessible tent and RV campsites with hookups; O.T.H.E.R… Oddities/Barriers: Sand; Terrain: Mostly dirt and some sand of about 5-8% grades; H2O/Water: Water normally clear. Water temperature in the summer can be around 50 to 60 degree. Drinking water available; Environmental Conditions: Extreme ocean like storms and large waves; Resources: Food, drinks, and gas in town of Bayview, ID. ACCESSIBILITY: PARKING... Large upper and lower parking lots; PATHS/TRAILS... Paved accessible paths into/from parking lot and launch area. Wide paved area at launch and beach area; RESTROOMS/FACILITIES/SHADE… Fully accessible restrooms. Shade via trees; DOCKS/LAUNCHES/PLATFORMS… Three accessible long launch docks. 4 lane paved launch; DIRECT WATER ACCESS… No developed access for wheeled mobility devices but paved area is right next to the beach; TRANSFER SYSTEMS... None; SENSORY... No sensory tactile markers for those with visual and other impairments; CAMPING... Fully accessible tent and RV campsites with hookups; O.T.H.E.R… Oddities/Barriers: Sand; Terrain: mostly dirt and some gravel, and paved areas in parking area of level to 7% grades; H2O/Water: Water normally clear. Water temperature in the summer can be around 50 to 60 degree. Drinking water available; Environmental Conditions: Extreme ocean like storms and large waves; Resources: Food, drinks, and gas in town of Bayview, ID. ACCESSIBILITY: PARKING... Gravel parking lot; PATHS/TRAILS... No developed paths/trails. Wide paved areas along shoreline; RESTROOMS/FACILITIES/SHADE… Restrooms not considered wheelchair accessible. No shade; DOCKS/LAUNCHES/PLATFORMS… Many non accessible docks within marina. Paved single lane cement launch at about 8% grade; DIRECT WATER ACCESS… No developed access for wheeled mobility devices. Absolutely no access to water other than via launch; TRANSFER SYSTEMS... None; SENSORY... No sensory tactile markers for those with visual and other impairments; CAMPING... No; O.T.H.E.R… Oddities/Barriers: No access other than at launch; Terrain: Level to 8% grade at launch; H2O/Water: Water clear. Water temperature in the summer can be around 50 to 60 degree. No drinking water available; Environmental Conditions: Extreme ocean like storms and large waves; Resources: Food, drinks, and gas in town of Sandpoint, ID. ACCESSIBILITY: PARKING... Small paved parking lot; PATHS/TRAILS... No developed paths/trails, however there is a wide paved area at launch site; RESTROOMS/FACILITIES/SHADE… Fully accessible restrooms. No shade; DOCKS/LAUNCHES/PLATFORMS… Two launch docks. Paved double lane cement launch at about 8% grade; DIRECT WATER ACCESS… No developed access for wheeled mobility devices. Absolutely no access to water other than via launch; TRANSFER SYSTEMS... None; SENSORY... No sensory tactile markers for those with visual and other impairments; CAMPING... No; O.T.H.E.R… Oddities/Barriers: Private shoreline other than at launch; Terrain: Level to 8% grade at launch; H2O/Water: Water clear. Water temperature in the summer can be around 50 to 60 degree. Drinking water available at store across the street; Environmental Conditions: Extreme ocean like storms and large waves; Resources: Food, drinks, and gas in town of Bayview, ID. ACCESSIBILITY: Two mooring buoys at this site; PARKING... See number 23 or 27 for parking/launch info; PATHS/TRAILS... Sand, pebble beach camping area, not wheelchair accessible; RESTROOMS/FACILITIES/SHADE… One fully accessible restroom. Shade via trees; DOCKS/LAUNCHES/PLATFORMS… No docks/platforms; DIRECT WATER ACCESS… No access for wheeled mobility devices; TRANSFER SYSTEMS... None; SENSORY... No sensory tactile markers for those with visual and other impairments; CAMPING... Primitive camping along beach; O.T.H.E.R… Oddities/Barriers: Lots of sand and pebbles; Terrain: Level at shoreline to progressively more includes as one progresses up the mounts; H2O/Water: Water normally clear. Water temperature in the summer can be around 50 to 60 degree. No drinking water available; Environmental Conditions: Extreme ocean like storms and large waves; Resources: Food, drinks, and gas in town of Bayview, ID. ACCESSIBILITY: Three mooring buoys at this site. PARKING... See number #23 or #27 for parking/launch info; PATHS/TRAILS... Sand, pebble beach camping area, not wheelchair accessible; RESTROOMS/FACILITIES/SHADE… One fully accessible restroom. Shade via trees; DOCKS/LAUNCHES/PLATFORMS… No docks/platforms; DIRECT WATER ACCESS… No access for wheeled mobility devices; TRANSFER SYSTEMS... None; SENSORY... No sensory tactile markers for those with visual and other impairments; CAMPING... Primitive camping along beach; O.T.H.E.R… Oddities/Barriers: Lots of sand and pebbles; Terrain: Level at shoreline to progressively more includes as one progresses up the mounts; H2O/Water: Water normally clear. Water temperature in the summer can be around 50 to 60 degree. No drinking water available; Environmental Conditions: Extreme ocean like storms and large waves; Resources: Food, drinks, and gas in towns of Bayview or Hope, ID. ACCESSIBILITY: PARKING... Gravel, dirt/mud parking along road; PATHS/TRAILS... No developed paths/trails; RESTROOMS/FACILITIES/SHADE… None. Shade via trees; DOCKS/LAUNCHES/PLATFORMS… No docks/platforms. No developed launch. Launch from shallow bank; DIRECT WATER ACCESS… No developed access for wheeled mobility devices; TRANSFER SYSTEMS... None; SENSORY... No sensory tactile markers for those with visual and other impairments; CAMPING... Primitive Camping on the south end of the road on the south side past the private homes; O.T.H.E.R… Oddities/Barriers: Sand; Terrain: level mostly at north section, and about 7% grades at south section; H2O/Water: Water normally clear. Water temperature in the summer can be around 50 to 60 degree. No drinking water available; Environmental Conditions: Extreme ocean like storms and large waves; Resources: Food, drinks, and gas in town of Sagle, ID. ACCESSIBILITY: PARKING... Large paved parking lot; PATHS/TRAILS... No developed paths/trails. Wide paved area at launch and along beach area; RESTROOMS/FACILITIES/SHADE… Fully accessible restrooms. Shade via trees; DOCKS/LAUNCHES/PLATFORMS… Two fully accessible docks. Paved two single lane cement launches at about 8% grades; DIRECT WATER ACCESS… No developed access for wheeled mobility devices. Could access water via beach but is very soft sandy beach; TRANSFER SYSTEMS... None; SENSORY... No sensory tactile markers for those with visual and other impairments; CAMPING... Accessible tent and RV campsites at campground across the street from the launch facility; O.T.H.E.R… Oddities/Barriers: Soft sandy shoreline. Parking late is mostly on an incline; Terrain: 3 to 8% grades; H2O/Water: Water clear. Water temperature in the summer can be around 50 to 60 degree. No drinking water available; Environmental Conditions: Extreme ocean like storms and large waves; Resources: Food, drinks, and gas in town of Sagle, ID. ACCESSIBILITY: PARKING... Gravel, dirt/mud parking lots; PATHS/TRAILS... Non wheelchair accessible steep wide trails to pebble beach; RESTROOMS/FACILITIES/SHADE… One accessible restroom. Shade via trees; DOCKS/LAUNCHES/PLATFORMS… No docks/platforms. No developed launch. Launch from beach; DIRECT WATER ACCESS… No developed access for wheeled mobility devices; TRANSFER SYSTEMS... None; SENSORY... No sensory tactile markers for those with visual and other impairments; CAMPING... Primitive camping; O.T.H.E.R… Oddities/Barriers: Loose dirt on trails and deep pebble beaches; Terrain: Varies from level to 8%; H2O/Water: Water normally clear. Water temperature in the summer can be around 50 to 60 degree. No drinking water available; Environmental Conditions: Extreme ocean like storms and large waves; Resources: Food, drinks, and gas in town of Sagle, ID. ACCESSIBILITY: PARKING... Small paved parking lot; PATHS/TRAILS... No developed paths/trails but wide paved road to launch and small beach area; RESTROOMS/FACILITIES/SHADE… Restrooms not considered wheelchair accessible. Shade via trees; DOCKS/LAUNCHES/PLATFORMS… One none wheelchair accessible main dock with several fingers. Paved single lane cement launch at about 5% grade; DIRECT WATER ACCESS… No developed access for wheeled mobility devices. Absolutely no access to water other than via launch; TRANSFER SYSTEMS... None; SENSORY... No sensory tactile markers for those with visual and other impairments; CAMPING... No; O.T.H.E.R… Oddities/Barriers: Only access to water is via launch; Terrain: Level to 7% grades; H2O/Water: Water clear until late summer. Water temperature in the summer can be around 60 to 70 degree. No drinking water available; Environmental Conditions: Varies; Resources: Food, drinks, and gas in town of Sandpoint, ID. ACCESSIBILITY: PARKING... Gravel dirt parking along road and at restroom/trailhead; PATHS/TRAILS... No developed paths/trails at lakeside. Single track trail at Trailhead/Restroom; RESTROOMS/FACILITIES/SHADE… Fully accessible restroom up the road (west) at Trailhead. Shade via trees; DOCKS/LAUNCHES/PLATFORMS… No docks/platforms. No developed launch. Launch/fish from very steep bank; DIRECT WATER ACCESS… No developed access for wheeled mobility devices; TRANSFER SYSTEMS... None; SENSORY... No sensory tactile markers for those with visual and other impairments; CAMPING... No; O.T.H.E.R… Oddities/Barriers: Mud; Terrain: Varies; H2O/Water: Water normally clear. Water temperature in the summer can be around 50 to 60 degree. No drinking water available; Environmental Conditions: Extreme ocean like storms and large waves; Resources: Food, drinks, and gas in town of Sandpoint, ID. ACCESSIBILITY: PARKING... Small dirt/mud parking area; PATHS/TRAILS... No developed paths/trails; RESTROOMS/FACILITIES/SHADE… None. Shade via trees; DOCKS/LAUNCHES/PLATFORMS… No dock/platform. Launch from low bank; DIRECT WATER ACCESS… No developed access for wheeled mobility devices. Absolutely no access to water other than via the bank; TRANSFER SYSTEMS... None; SENSORY... No sensory tactile markers for those with visual and other impairments; CAMPING... No; O.T.H.E.R… Oddities/Barriers: Mud and marine vegetation along shoreline; Terrain: Level to 6% grade; H2O/Water: Water clear until late summer. Water temperature in the summer can be around 60 to 70 degree. No drinking water available; Environmental Conditions: Varies; Resources: Food, drinks, and gas in town of Sandpoint, ID. ACCESSIBILITY: PARKING... Gravel parking lot; PATHS/TRAILS... Paved accessible paths around hatchery grounds, and to public dock; RESTROOMS/FACILITIES/SHADE… Fully accessible restrooms within Hatchery building. Shade via trees; DOCKS/LAUNCHES/PLATFORMS… One fully accessible dock. No developed launch. Not a place designed to launch from but one could launch a kayak/canoe from the dock; DIRECT WATER ACCESS… No developed access for wheeled mobility devices; TRANSFER SYSTEMS... None; SENSORY... No sensory tactile markers for those with visual and other impairments; CAMPING... No; O.T.H.E.R… Oddities/Barriers: Nothing unusual; Terrain: Level to 5% grades; H2O/Water: Water normally clear. Water temperature in the summer can be around 50 to 60 degree. Drinking water available; Environmental Conditions: Varies; Resources: Food, drinks, and gas in town of Sandpoint, ID. ACCESSIBILITY: PARKING... Pave upper and lower parking lots; PATHS/TRAILS... No developed paths/trails but there is paved road to boat launch and next to beach; RESTROOMS/FACILITIES/SHADE… Fully accessible restrooms. Shade via trees; DOCKS/LAUNCHES/PLATFORMS… One fully accessible dock. Paved single lane cement launch at about 6% grade; DIRECT WATER ACCESS… No developed access for wheeled mobility devices. However pavement goes right up to small soft sandy beach next to boat launch; TRANSFER SYSTEMS... None; SENSORY... No sensory tactile markers for those with visual and other impairments; CAMPING... Accessible tent and RV campsites with hookups; O.T.H.E.R… Oddities/Barriers: Mud and soft sand shoreline; Terrain: Level to 6% grades; H2O/Water: Water clear until late summer. Water temperature in the summer can be around 60 to 70 degree. Drinking water available; Environmental Conditions: Varies; Resources: Food, drinks, and gas in town of Sandpoint, ID. ACCESSIBILITY: PARKING... Paved parking lots; PATHS/TRAILS... Pave accessible paths to launch dock and to beach area; RESTROOMS/FACILITIES/SHADE… Fully accessible restrooms. Shade via trees; DOCKS/LAUNCHES/PLATFORMS… One accessible launch dock. One paved launch at 5% grade; DIRECT WATER ACCESS… No developed access for wheeled mobility devices but paved path does get close to the waters edge at the sandy beach; TRANSFER SYSTEMS... None; SENSORY... No sensory tactile markers for those with visual and other impairments; CAMPING... No; O.T.H.E.R… Oddities/Barriers: Sand; Terrain: Mostly level to 5% grade at launch; H2O/Water: Water normally clear. Water temperature in the summer can be around 60 to 70 degree. No drinking water available; Environmental Conditions: Varies; Resources: Food, drinks at Dover Resort cafe and food, drinks, and gas in town of Sandpoint, ID. MARINA INFO - There are 7 commercial marinas on the lake. Check them out below. 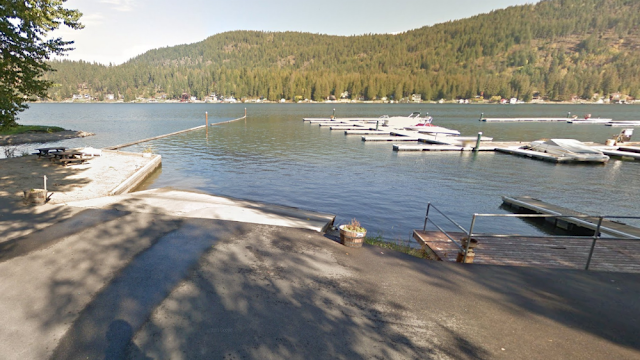 Harbor Marina: Harbor Marine is located in Garfield Bay, which is just 15 miles from Sandpoint Idaho and right in the middle of the western shore of the lake. It's about an 18-mile boat ride to either Sandpoint. It's also in an area known by fishermen as a place where big ones are caught. There are courtesy tie-ups at Harbor Marina, along with services of gas, restaurant, tackle, snacks, and boating supplies. The Forest Service maintains a public boat launch, swimming area and campground. Phone: 208-263-9595. Bitter End Marina: 17280 E. Bitterend Marina Rd. Bayview, Idaho. 83803. This is a private sailboat marina for members only. There is no launch site at this marina. Phone: 208-683-2534. MAP: See interactive google map near the start of this page, or visit google.com/maps and type in Bayview, Idaho, Kootenai County, Idaho for the south end of the lake or Sandpoint Idaho, Bonner County, Idaho for the north end of the lake.